While the subject of Somali pirating is the same, this already-celebrated Danish film produced before 'Captain Phillips' has considerably less flare but admirably inhabits the same space as Paul Greengrass’s Hollywood version. ‘A Hijacking’ lasers in the attrition of the lengthy negotiation process between the stingy corporation and the wily Somali pirates, with a result no less harrowing and intense. Mr. Lindholm’s modus operandi is startling clear in making this picture – to tell a film which could have been made as Captain Phillips, a robust action film, into a constained character-based battle of attrition. Despite the title, we don’t even see the hijacking. 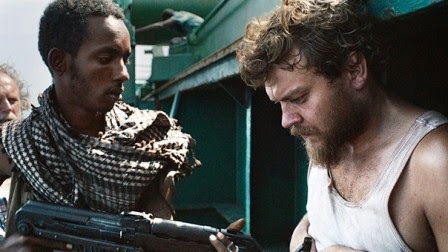 After following the film’s lead character, Mikkel Hartmann (Asbæk), a humble cook, around the deck to establish the location, the hijacking occurs off camera. Likely without sufficient money to craft an action scene comparable to Captain Phillips, Lindholm chooses instead to reveal the hijacking from the point of view of the President of the shipping company back in Denmark. Then we see the cook being thrown to the ground shackled and dumped in a compartment below deck. Do we get the feeling of false advertising? Admittedly the chain of events in these early stages is jarring. We only see a glimpse of the Captain; never see the leader of the hijackers, only the cook, a couple of his friends and a Somali named Omar who openly absolves his connection to the hijackers as simply the negotiator. Back in Copenhagen Peter C. Ludvigsen (Malling), despite the advice of their consultant refuses to use a negotiator, boldly (and egotistically) choosing to be the saviour himself. And so the pieces are set for Lindholm’s unconventional thriller. As Lindholm cuts between the office of the President and Mikkel below deck of the ship, days pass. Day 1 turns into Day 7, then Day 14 and on and on and on, to well over 100 days. While having a gun stuck to one’s head sounds harrowing so does spending over three months holed up in a metal cabin without ever seeing daylight. And even more frustrating is watching the ineffectual negotiations of the company try to bridge the gap between the initial $19million ransom demanded by the Somalis and the $250,000 offer by the Danes. Thus, A Hijacking becomes the supremely anti-heroic version of Captain Phillips, but arguably cutting deeper into our psyches. Lindholm admirably avoids overtly villifying Ludvigsen the President. Under anyone else’s watch his could have been characterized as a shameless capitalist disconnected and disconcerned with his crew. This theme does come across, but not through Ludvigsen, but the advice of his consultants, his Board of Directors and his ingrained sense superiority and hubris as a CEO. Lindholm’s delicacy and search for truth and honesty in his characters cuts through any desire to see guns-a-blazin’ in this memorable and throught-provoking sea-thriller.